It’s easier than ever to catch a bus on Third Avenue. Riders can now pay with ORCA cards at sidewalk kiosks and climb on through any door. The change will speed up boarding and reduce wait times at each stop. Fare-reading kiosks are now installed at 21 of Third Avenue’s 30 bus stops. Kiosks will be added to the remaining stops between April and December 2019. 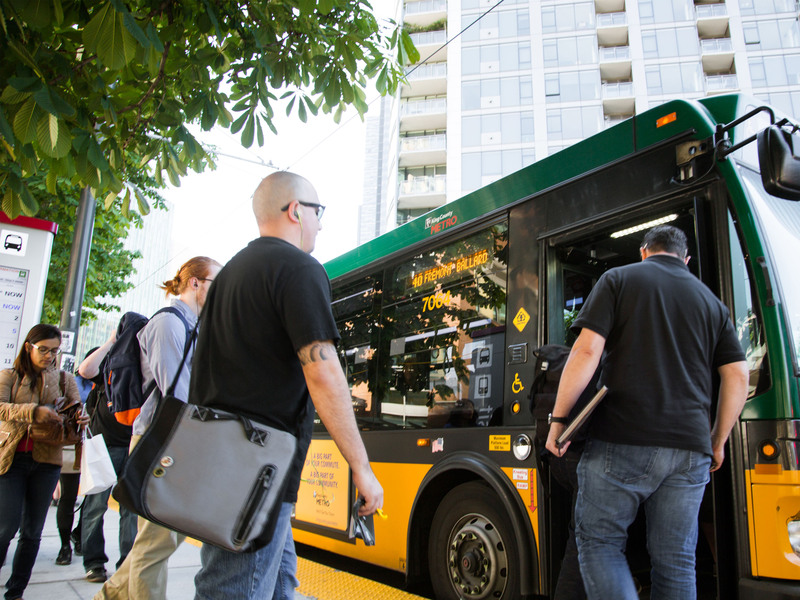 Until then, transit employees will scan ORCA cards at these locations using handheld fare readers on weekdays from 3:30 – 6:30 p.m.
Riders can also tap to pay once on board, or pay cash. Fares will be enforced through periodic sweeps by transit officers, as is currently done on RapidRide lines and Link light rail. The new options will help offset traffic, as construction on the Washington State Convention Center Addition and the East Link light rail extension has brought buses out of the Downtown Seattle Transit Tunnel onto downtown surface streets. SDOT is also adding stripes on Fifth and Sixth avenues to serve former tunnel routes. The new lines will allow buses to move in dedicated lanes. The improvements are funded by a joint $30 million investment by King County, Seattle and Sound Transit. A full list of changes is available on King County’s website. Third Avenue serves 290 buses an hour during peak times (the most in the nation), 42 routes and more 52,000 riders each weekday. The corridor is crucial to the downtown transit network. However, we believe it can do more than just move transit. That’s why, starting in 2017, DSA led a year-long process to outline a new vision for Third Avenue. We expect to publish the report soon, along with detailed transit strategies and potential partnerships. Together we can transform this hard-working transit corridor into one of America’s great streets, serving the diverse needs of commuters, pedestrians, business owners and residents.